A French marble fireplaces design. One of our many French marble fireplaces. 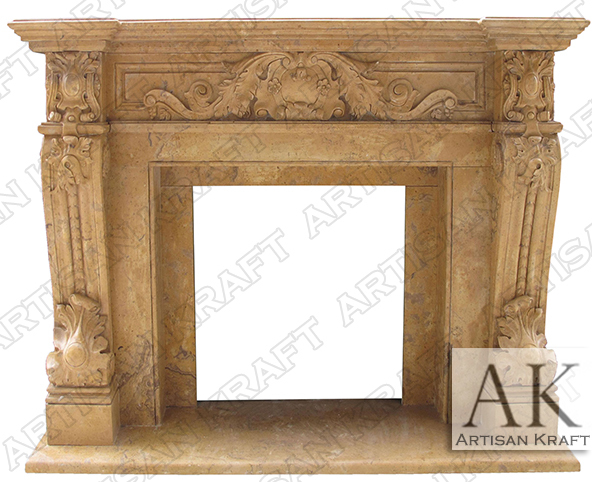 Beautiful light caramel marble fireplace with hand crafted leaf and medallion details. The marble mantle shelf has a very ornate design that is seen in the marble fireplaces legs. Hearth is made from the same marble as the rest of this marble fireplace mantel surround. Only the highest quality fireplaces are made by us. This is a historic French replica design. This mantel facing as well as others can be made custom. Currently in Stock and on Sale French Fireplace Click Here. Materials: cast stone, travertine, limestone, sandstone, marble etc. Available in many different colors, textures and finishes.